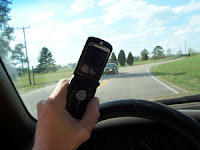 Yesterday marked the passing into law of Bill 16, which levels heavy fines against drivers caught texting, making phone calls, doing their makeup, or doing anything that substantially distracts them from driving. The fine, which does not include demerit points, is a hefty $172 and is intended to curb the number of distracted drivers on the road. It is only recently that the dangers of distracted driving have come to the fore, with other problems such as impaired driving attracting more attention. According to the US Department of Transportation, 20% of all injury collisions in 2009 involved reports of distracted driving. That amounts to 5,474 people killed in one year because of people text, eating, grooming or talking on the phone while driving. What makes it all the worse is that it's so easily prevented! If you're someone who seems unable to stop driving with distractions, there are a few quick measures to help you drive more responsibly. Since driving while texting and driving while talking on the phone are the most common forms of distracted driving, place your phone in the trunk of your vehicle so you never feel tempted to check your Facebook or text some friends while you're at a red light. If you're someone who rushes through their morning routine and spares no time for eating or grooming, plan out your mornings in advance or buy quick snacks for breakfast. It only takes a few moments to think about the time you'll need to get ready in the morning; budget your time effectively so that you leave enough time to eat. If you don't have much time at all, get quick snacks you can eat very quickly before you leave. From a health perspective, this is never as healthy as a full breakfast eaten in a relaxed manner, but at least it will stop you from downing food on the road. Ultimately, there is no excuse for distracted driving. As a driver, you have a responsibility to safely share the road with other drivers. You would expect others to focus on the road and do their best to avoid collisions, so why should there be any exception? Enjoyed reading your post - thanks for the information and I must say you have some great idea's. Please visit my Accident at Work Wakefield page and leave us some feedback and comments.